Pour 1/4 cup (60 ml) milk into your skillet and gently heat. Add the onion and simmer until soft, then add your fish fillet. Cover and simmer 5-10 minutes. The fish should be opaque and flaky. Remove from heat and mash, or flake fish with fork. To store, separate into small containers and spoon your milk and onions over top. This also freezes nicely. 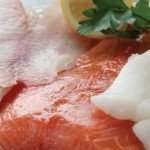 Poached Fresh Fish – – Milk, Onion (chopped), Salmon (fillet of fresh fish (sole, salmon or haddock)), – Pour 1/4 cup (60 ml) milk into your skillet and gently heat. Add the onion and simmer until soft, then add your fish fillet. Cover and simmer 5-10 minutes. The fish should be opaque and flaky. Remove from heat and mash, or flake fish with fork. To store, separate into small containers and spoon your milk and onions over top. This also freezes nicely.